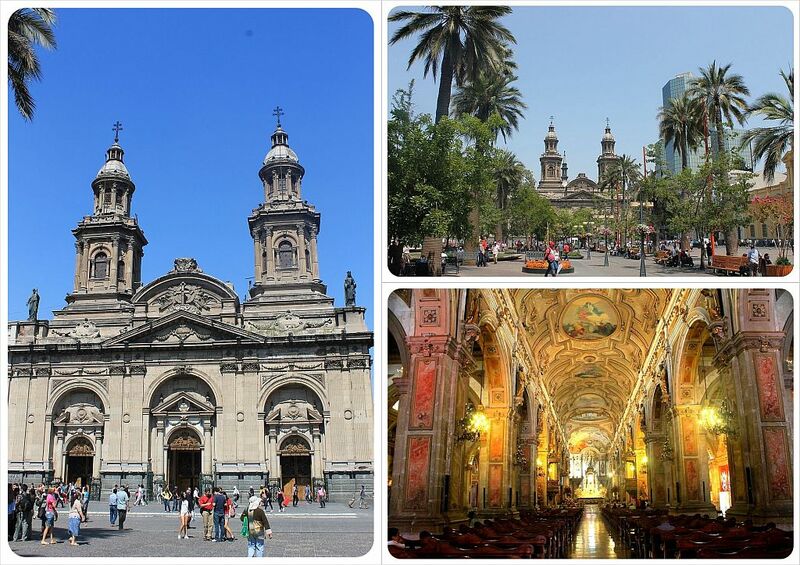 Head down one of the pedestrian shopping streets – Ahumada or Estado – that connect the Plaza De Armas with the Libertador Bernardo O’Higgins Avenue, the city’s main artery. Either one makes for good window-shopping and both have several (above-board) Café con Piernas, (coffee with legs). These unique coffee shops are a Santiago institution, where waitresses flaunt their legs while serving fairly good quality coffee to ogling men and gossiping ladies. Although some can be of a seedier variety, the ones on the main drags – Café Haiti and Café Caribe – are filled with people of all ages, even families, who stop in for coffee. 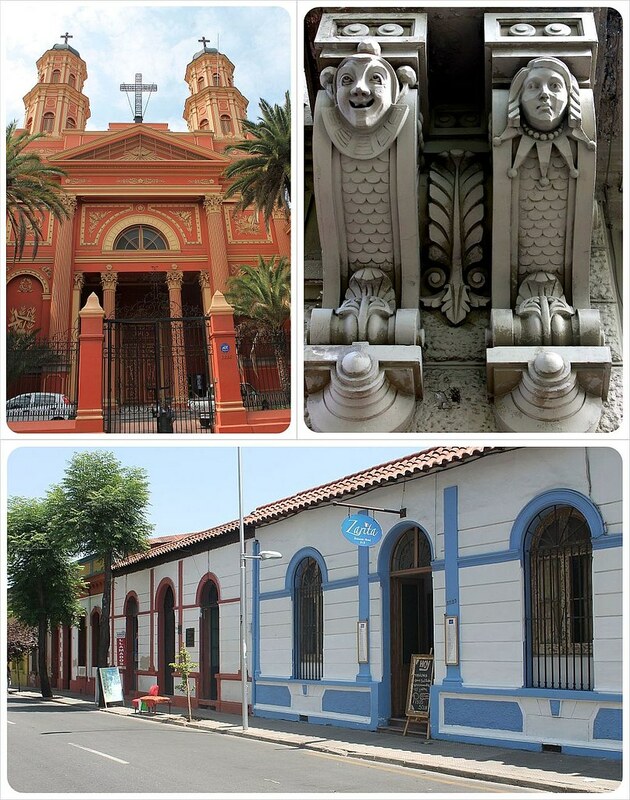 Once you reach Libertador Bernardo O’Higgins, turn left and head towards Cerro Santa Lucia. 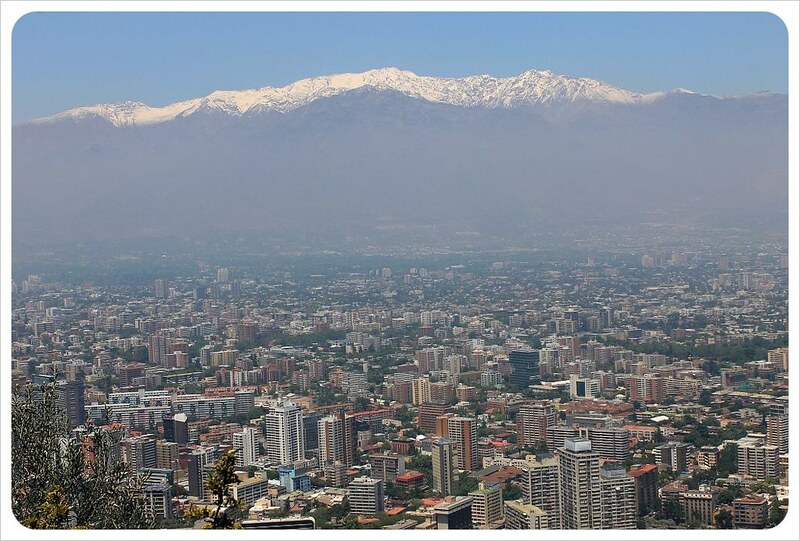 Set just inside the mighty Andes Mountains, Santiago itself is mainly flat, but there are two cerros (hills) right in the city center that afford perfect views of the city. 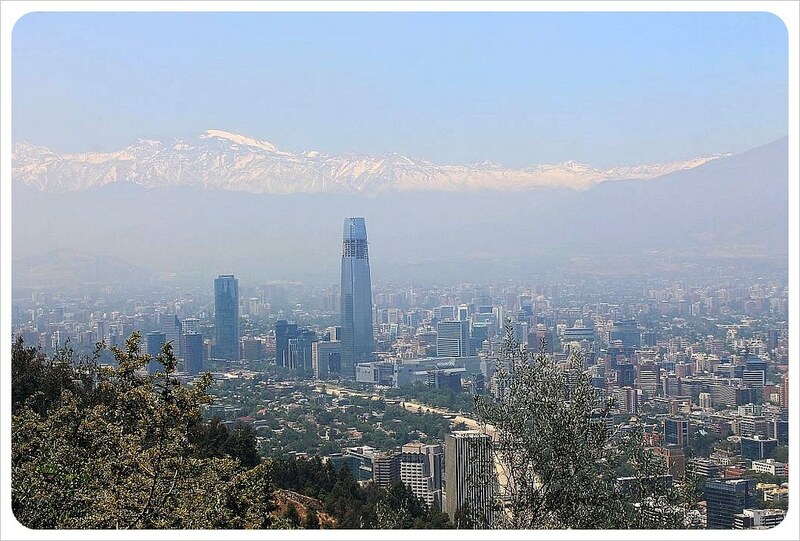 Santiago was founded right on Cerro Santa Lucia, but today it is appreciated more as a lookout over the trendy Lastarria neighborhood and, on a clear day free of smog, the views that spread out over the city to the Andes mountains beyond. The hill itself is gorgeous, with majestic fountains, intricate Spanish tile work, even a European style (mini) castle and gorgeous gardens on every level, all the way to the top. 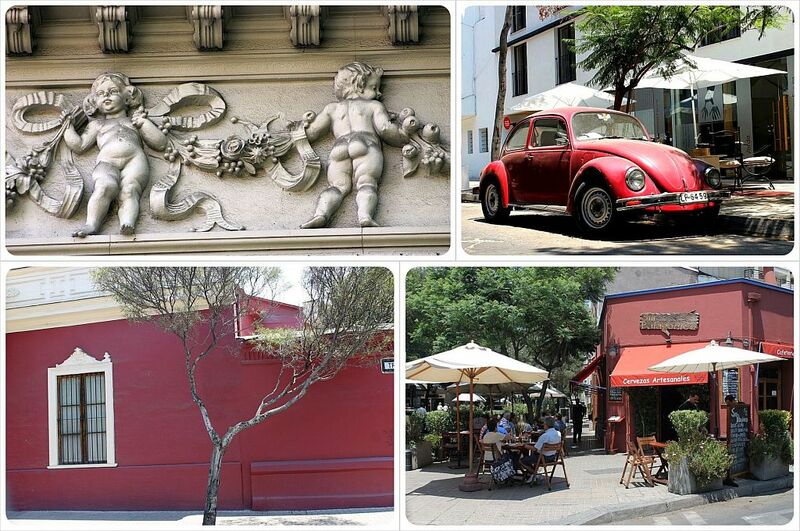 After enjoying the views, it is time for a break – and you are right next to the best neighborhood to relax – Lastarria. Just a short walk further down on Libertador Bernardo O’Higgins, turn left on Jose Victorino Lastarria, the main street through the barrio (quarter). Lastarria is popular with tourists and locals alike, and you will see many locals flock here to eat in the excellent restaurants, chat in creative cafes, and take in the interesting architecture and colorful neo-classical buildings, including the gorgeous Ivy House. On the weekends, there is a little flea market and if you need a quick pick-me-up, Café Wonderful (Lastarria 90) is truly wonderful indeed. If you’d prefer to sample Chilean wines, you can do this just a few doors down at BocaNariz (Lastarria 276). They have over one hundred native wines on their menu and also offer several sample options where you can try three different 50ml glasses of wine. Our tip: the Fresh & Fruity white wine sample on a warm afternoon is perfection. You could eat in any of the many restaurants on Lastarria, but for a hearty meal head to La Fuente Alemana for a truly Chilean lunch experience – even Anthony Bourdain stopped here for lunch and loved it. This old-fashioned diner-style restaurant has seats around a large, square, open kitchen – just pull up a seat at the counter and watch the cooks prepare massive lomitos – Chilean-style sandwiches loaded with roasted pork, avocado, lettuce, tomato, cheese and other ingredients. There are other branches around town, but the most central we’ve seen is at Avenida Libertador Bernardo O’Higgins just across the river from Barrio Bellavista near the Baquedano metro station, just a short walk further down from the Lastarria neighborhood, on the way to the next stop: Bellavista. After you’ve eaten, head further east from here, either on Merced or Parque Forestal, the park across the street, until you get to Plaza Italia. 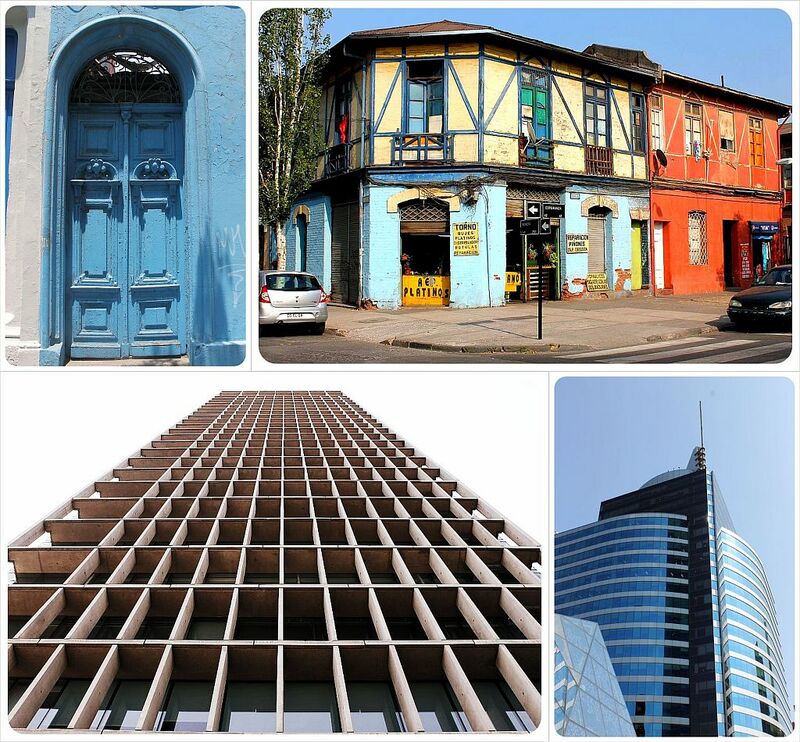 Once you have reached Plaza Italia, turn left and cross the Mapocho River and you will find yourself on Pio Nono, the main street of the Bellavista neighborhood. Bellavista is a bohemian area with a fun, youthful vibe that is packed with restaurants, bars and clubs, many of which are located on Pío Nono street. Pio Nono leads straight to Cerro San Cristobal, your next stop. Meander through the side streets of this barrio to see centuries’ old mansions, colonial houses and the best street art in the city. Bellavista is also home to Pablo Neruda’s Santiago home La Chascona (just follow the signs up around the hill) and definitely check out Patio Bellavista – filled with shops and restaurants, including one of my favorite breakfast/brunch spots – a French bakery/restaurant called Le Fournil. Take Pio Nono to the end to reach the bottom of Cerro San Cristobal, the city’s second highest hill with a 14 meter tall Virgin Mary statue on top that can be seen far and wide. San Cristobal affords the best views and if you are not too tired, you can hike 45 minutes to the top. If steep hikes on uneven terrain aren’t your idea of fun, you can also either hop on the funicular (when it’s working) or take a free bus up to the top (when it’s not). Leave your fancy clothes at home and make your way to La Piojera, a gritty cantina just around the corner from Mercado Central (Calle Aillavilu 1030). This local watering hole is the ultimate Chilean experience, packed with the entire gamut of Chileans (and a few savvy out-of-towners), all there to enjoy the bar’s infamous Terremotos (earthquake), a deliciously strong drink made of Pipeño (a sweet fermented wine), pineapple ice cream and Fernet Branca (herbal liquor). A half liter costs less than US$4 and is enough to make you stumble (hence the name). La Piojera can get pretty crowded, loud and rowdy, especially in the summer months and on weekends. 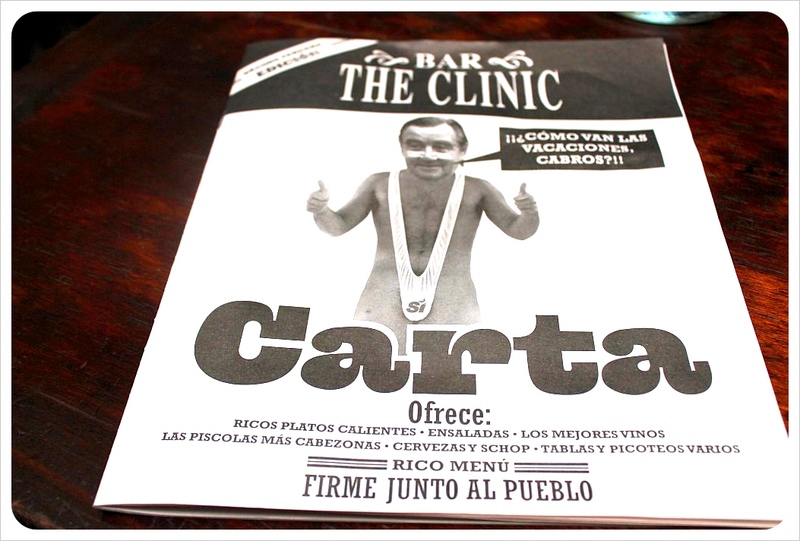 If you are looking for a quieter, more intellectual vibe, I recommend The Clinic, named after the satirical Chilean newspaper The Clinic (comparable to The Onion), which pokes fun at the country’s right wing party in posters and the menu – which is printed in a satirical newspaper format. If you speak Spanish, you can get great insight here of Chile’s current political issues, relationship with neighboring countries and also some witty, sharp international commentary. 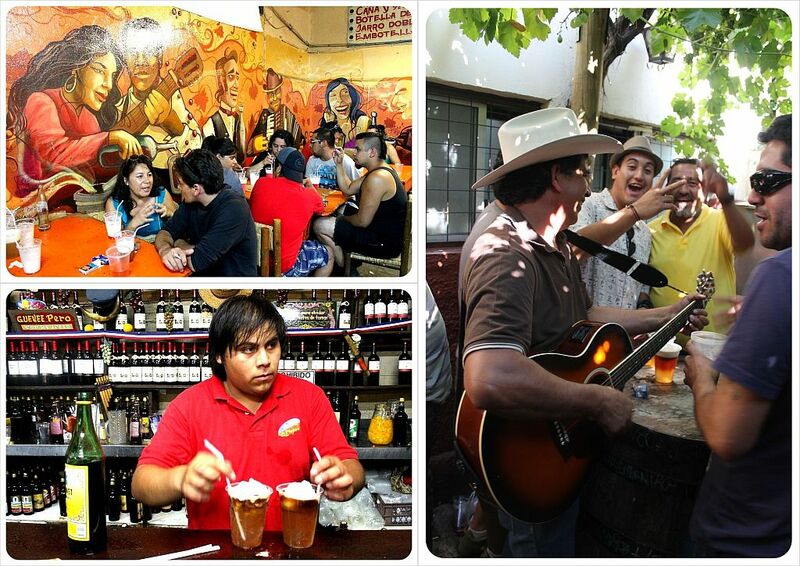 Along with the political statements you can also enjoy typical Chilean dishes and drinks here. Assuming you’re up and running the next morning after your big night out, don’t skip a morning trip to Barrio Yungay and nearby Barrio Brasil. Here you’ll find sprawling 19th century mansions of wealthy landowning Santiagueños, quiet squares with towering exotic trees rustling in the breeze and cute local cafes to pass the time. 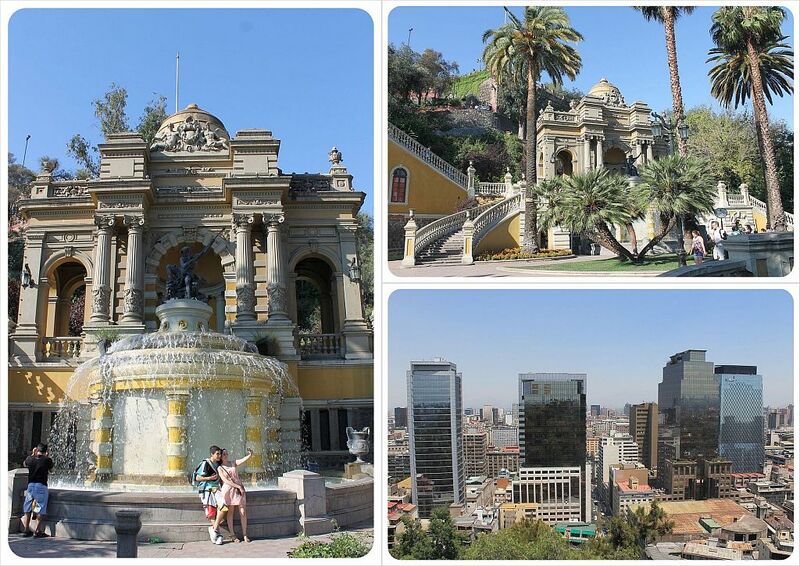 Although these two neighborhoods are just a few metro stops from the Plaza de Armas, most people do not visit here. The best place to start is the Republica Subway Station (on the red line). 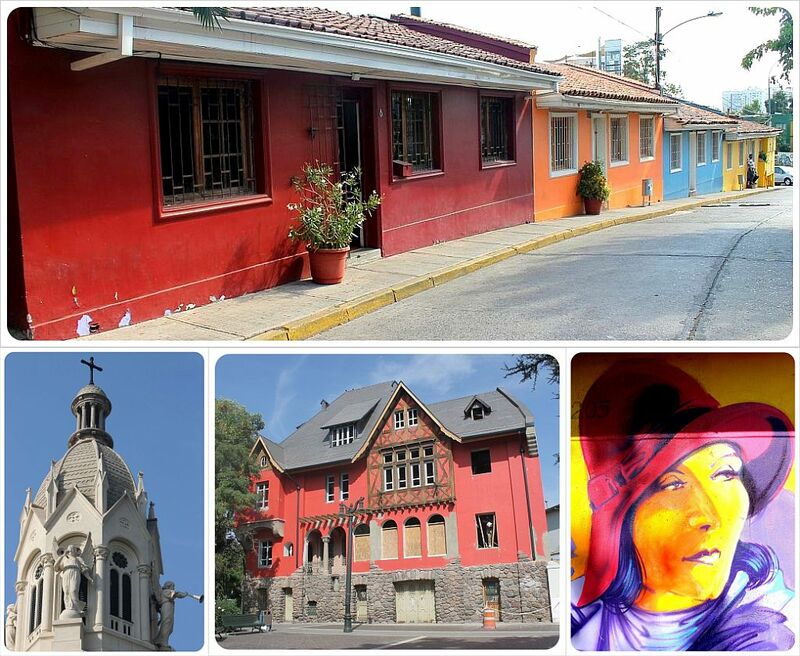 From here, take Maturana into the neighborhood, and don’t miss the Basilica del Salvador and Plaza Brasil on Huerfanos, the Parroquia de Nuestra Senora de la Precio Sangre Church on Compana de Jesus, and Plaza Yungay on Rosa. Barrio Brazil was an upper-class neighborhood in the 1800s, and many of the mansions from that time remain, while Barrio Yungay feels more typically ‘Latin American’, with colorful, if slightly crumbling, colonial houses and cobblestone streets. In Barrio Yungay, from Plaza Yungay, walk Libertad three blocks south to Peluqueria Francesa, an old-fashioned barbershop / fabulously decorated eatery. Stop for a coffee (or breakfast) here to take in what feels like a time-warp to the 1920s, with walls decorated with memorabilia like movie posters, antique furniture, dolls, and a surprisingly rich collection of barbershop-related paraphernalia. Perhaps more importantly for some, Happy Hour here is actually ‘Happy Day’ (10am to 9pm) and Pisco Sours are only $3! 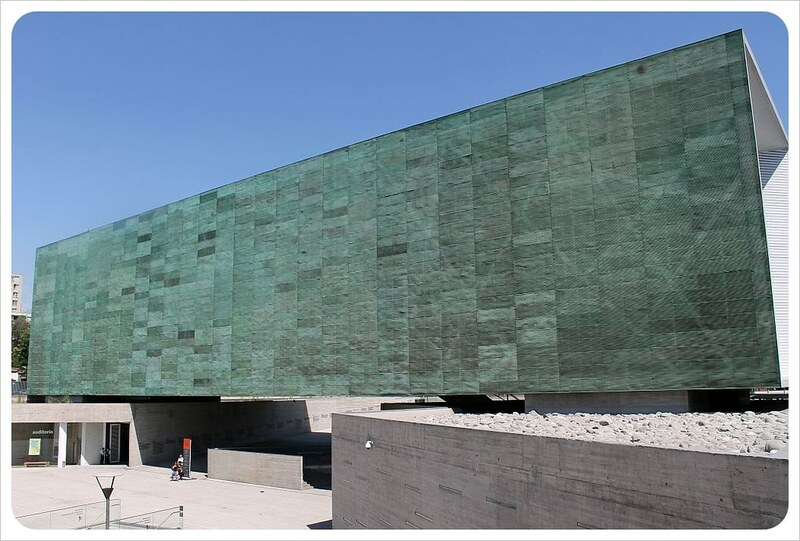 Before leaving Santiago, a trip to the Museo de la Memoria, Santiago’s Human Rights Museum is an absolute must. From La Peluqeria Francesa, take Compañia de Jesus four blocks to the west and turn right on Chacabuco, where you will see the museum on the left side. Entry is by donation only, so spend an hour learning about Chile’s very dark and recent history under Pinochet’s military dictatorship between 1973 and 1990. Tens of thousands of innocent citizens ‘disappeared’, more were brutally tortured and countless starved under this strict dictatorship. Although so many Santigueños were affected, people today are focused on growth and the future, so this is your best chance at engaging in any dialogue or learning much about the regime in any detail. In line with Santiago’s affinity for incredible architecture, of course, the building itself is an incredible, modern structure conceived by a group of Brazilian architects. You’ll no doubt need to relax after the museum, so head right across the street to Quinta Normal park, a large park where you can take a boat ride on the lake, relax with a picnic, watch happy kids splashing in the fountains, or, if you truly are a super tourist, you can visit even more museums: The Natural History Museum, the Science and Technology Museum, the Museo Ferroviario (Railway Museum) and the Artequín Museum are all located within the park’s borders. 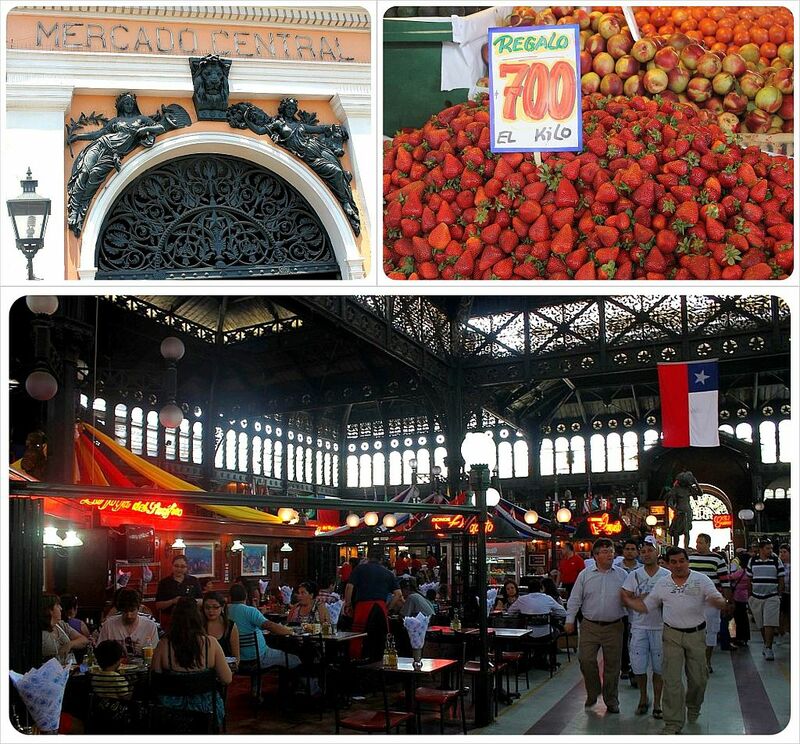 After the park, take the subway (the station is located right at the park’s entrance) to Santiago’s Mercado Central, located at the Puente Cal Y Canto Metro Station. The easiest way is to take the red line to Los Heroes, change onto the yellow line here and take it two stops to Puente Cal Y Canto. Mercado Central is clean, bright and packed with fish stalls and quaintly decorated restaurants for some of the freshest fish dishes in the country. If you are into seafood, this is the perfect place for lunch! Take the subway #2 from Cal Y Canto two stops to Los Heroes and change onto line #1 to Pedro de Valdivia. Exit and turn north on Concepcion, cross the river again and you’ll be right inside the free Sculpture Park, which has the best concentration of public art in Santiago, a city proud of its public art collection. 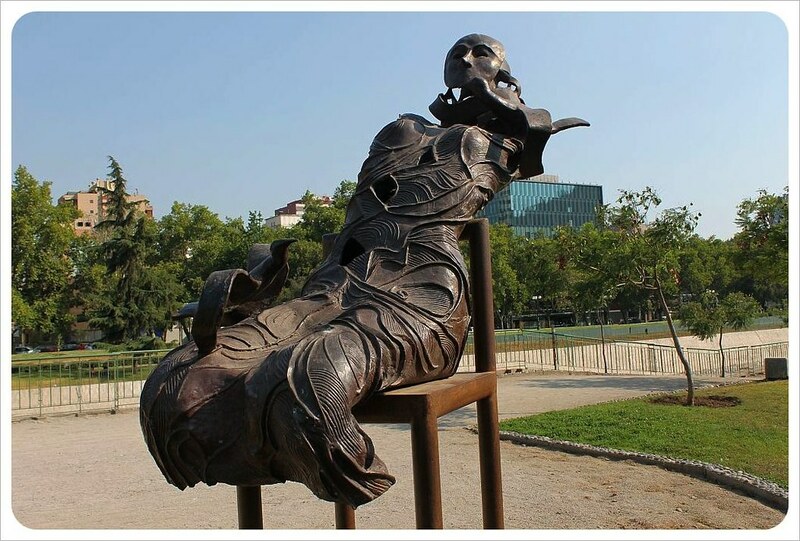 Within walking distance of the Gran Torre de Santiago, which is the tallest building in South America, the park has over 30 wood, bronze and steel pieces by popular Chilean artists. If you don’t care much for art, you can also just sit in the park and enjoy a book or have some ice cream, or, if you are a fan of panoramic views and want to enjoy more of those, from the highest viewpoint in Santiago, head to Sky Costanera, the Observation Deck on top of the Gran Torre de Santiago. Since the skyscraper is the tallest building in Latin America, you’re enjoying vistas from the highest observation deck south of the U.S. here! Tickets are pretty cheap – CLP10,000 (US$14.75) on a regular day, and only CLP7,500 (~ US$11) on Wednesdays. After marveling at the beautiful sculptures, it’s time for another delicious meal in Santiago! 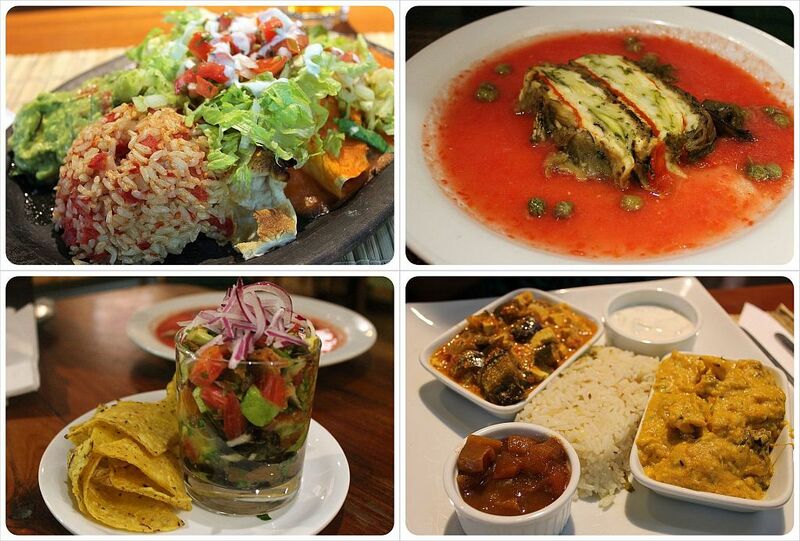 If you are up for vegetarian food, you’ll find the best vegetarian restaurant in all of Santiago within walking distance from the park – El Huerto is located on Calle Orrego Luco 54, near the Pedro De Valdivia subway station. Other restaurants on the same street, a quiet side street of the busy Providencia neighborhood, include the popular Le Flaubert and Café Del Patio. If you didn’t check out La Fuente Alemana on your walk yesterday (or want more lomitos!) you can also find a branch of the popular sandwich bar on the way from the park to the subway (Avda Pedro de Valdivia 210, on the corner of Andres Bello). Since Santiago is a sprawl of several neighborhoods, and with 5.5 million people the 7th most populous city in Latin America, picking a place to stay can be a daunting task. Which neighborhood is the most convenient for a few short days of urban exploration? Which neighborhoods are safe? 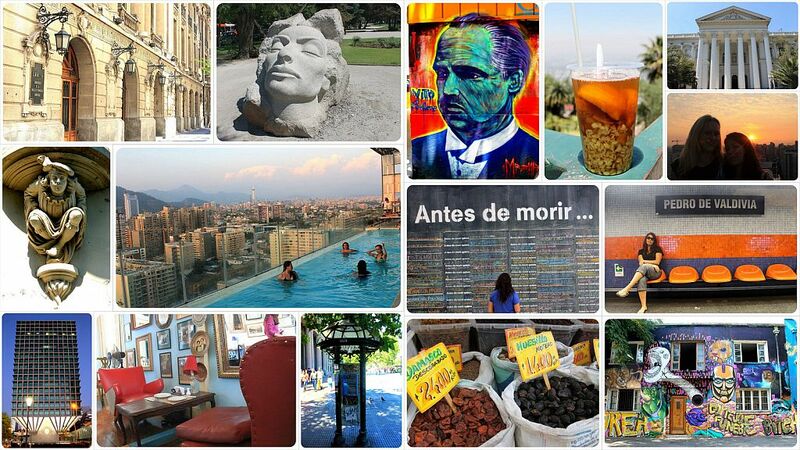 Which hotels in Santiago are good? 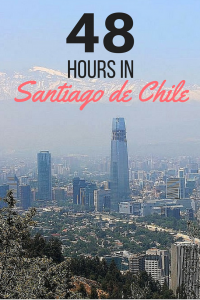 Luckily, Santiago is a pretty safe city – especially compared to other Latin American metropoles – and has a fantastic public transportation system. Buses and subways bring you everywhere in no time, and if you prefer getting around by car, you’ll be happy to hear that Uber is operating in Santiago now. As for hotels: The W (near the Gran Torre skyscraper) is your best option for a splurge, and several other well known high-end international brands such as Marriott, Sheraton, Crown Plaza, RitzCarlton and Grand Hyatt all have hotels in Santiago. If you don’t want to spend that much, there are plenty of mid-range hotels that often have great deals (on my second visit to Santiago I stayed in a swanky apart-hotel with amazing views over the city for only $50 a night) and of course there are dozens of hostels, if you are traveling on a budget. You had me at La Piojera and earthquakes! Hope all is well, Dani!